All the related pages are listed on the RIGHT! As the new year approaches, people around the world will make resolutions to live happier, more meaningful, more productive lives in 2018. Perhaps they want to get involved and give back to their community. Maybe they want to improve the world on a larger scale. Or they might be hoping to make new friends or professional connections. Is your club following up with prospective members? Every January, we see a sharp increase in inquiries about joining Rotary. Prospective members tell us about themselves and what they want in a Rotary club through rotary.org/join. Rotary staff screens these inquiries and sends them to district leaders, who then match the prospective members, or leads, with clubs that might meet their needs. It’s up to clubs to make sure that these people in their communities who want to make a difference hear back from Rotary. 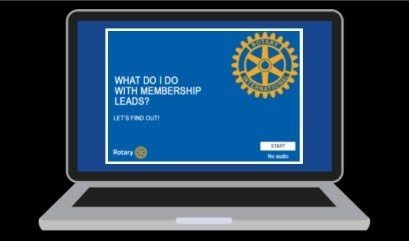 Learn how you can follow up on your membership leads to find great new Rotarians. What first impression does your club give? Is your club welcoming to guests? How do you promote it? Rotary’s customizable club brochure, available on Brand Center, allows you to upload photos of your club in action and show your community its projects and events. Visit the Learning Center to take the new Online Membership Leads course. You’ll see what a prospective member experiences after expressing interest in Rotary. You’ll also learn how you can create a consistent, positive experience for prospective members. Sign in to My Rotary to take the course. In the Learning Center, select the Membership category from the left side of the page, and then select the Online Membership Leads course. Watch a recording of the webinar Hot, Warm, and Cold Leads: Engaging Your Prospective Members. The webinar covers how you can respond to leads, check and update their status, and find prospective members that are waiting to hear from your club. Last year, the 2016 Council on Legislation raised dues by $4 to meet members’ growing need for improved products and services. Thanks to this increased support, we’ve provided tools that allow members to expand their clubs and better serve their communities. Both Rotary.org and Rotary Club Central were completely redesigned in 2017. They are now faster, easier to navigate, and accessible on mobile devices — important for busy members who are always going somewhere. We wanted to make your interactions with Rotary better, too. To that end, we’ve improved our member support, expanded automation efforts, and kept up with changing security and privacy requirements. Membership Development Power Point Presentations. Rotary has a tremendous story to tell. The job of the PI team in District 1145 is to help the clubs in the District and the District Teams to tell that story to the public. Material related to L, D & T will be posted here! This will remain a constant for the Rotary Year ; the articles and items on the related pages next to this and on "Latest Pages " above will be updated and changed during the course of the year. Rules for some of the Competitions are listed here. Applications for matching grants of up to £250 are invited from any Rotary Club within District 1145 that wishes to support a young sportsperson or youth sports group within their local area.